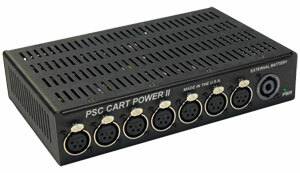 Professional Sound Corporation is pleased to announce our new PSC Cart Power II. This new design offers the same features as the original unit, but with improved specifications. This new PSC cart Power II offers a convenient way to distribute DC power to all of the equipment on your small sound cart. The PSC Cart Power II can be operated from world-wide AC power without adjustment and will provide up to 10 amps of DC current to power your equipment. In addition, it contains an external battery input which will allow you to operate from battery power. You can also operate it on both AC power and battery power at the same time. In this case, the unit becomes an un-interruptible power source. It will operate from AC power as long as the AC power is available. If the AC power gets cut off, the unit will automatically switch over to battery power in a seamless and quiet manner. Each output of the PSC Cart Power II contains a PSC Quiet Power Technologytm filter designed to block inter-modulation noise sources common in today’s equipment. Additionally, each output is individually protected against short circuits through the use of automatically re-setting Polyfuses. 8.5" x 5.5" x 1.75"